MEGS is provided by LASP. 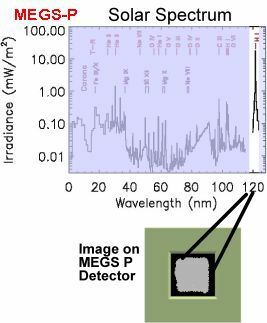 MEGS provides the solar EUV spectral measurements from 5 nm to 105 nm with 0.1 nm spectral resolution and with 10 sec cadence. MEGS uses back-illuminated 2048 x 1024 CCD cameras and camera electronics from MIT Lincoln Laboratory. Much of the heritage for MEGS is from the TIMED SEE instrument. 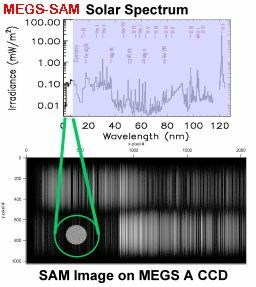 These images show the MEGS-A and SAM spectral ranges (white bands) and example CCD image. The image has the color table stretched to highlight both weak and bright emission lines. MEGS-A has two slits, so there are top and bottom spectra on the CCD image. The solar image is from MEGS-SAM pinhole camera that also uses the MEGS-A CCD detector. This picture shows the optical layout for MEGS-A. 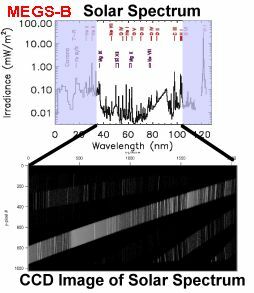 The solar radiation enters from the left, goes through foil filters and slit, and different wavelengths reflect / diffract off the spherical grating onto the CCD detector. 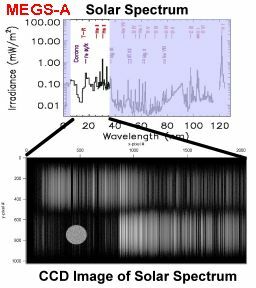 These images show the MEGS-B and -P spectral ranges (white bands) and example CCD image. The image has the color table stretched to highlight both weak and bright emission lines. MEGS-B has single entrance slit but two cross-dispersed gratings, so the spectrum goes diagonally across the CCD image. The MEGS-P is a Si photodiode that picks off light at 121.6 nm from the first MEGS-B grating. This picture shows the optical layout for MEGS-B. The solar radiation enters from the left, goes through an entrance slit, diffracts off the first spherical grating, goes through another slit, and then diffracts off the second spherical grating onto the CCD detector.